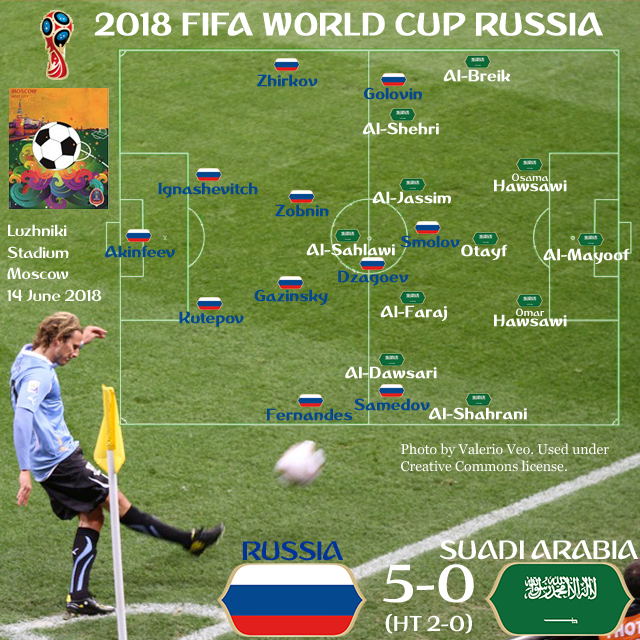 Russia produced a dominating win over Saudi Arabia in this opening match of the 2018 World Cup in a game that was more exciting than skillful. Much of the pre-game discussion focused on the fact that these were the two worst teams in the World Cup–justifiably so, though the game itself was fairly entertaining. Juan Antonio Pizzi set out Saudi Arabia in a 4-3-3, presumably in the hope that a three-man midfield would allow his team to control the ball against a weak opponent. This did not prove to be the case, as Saudi Arabia struggled to implement Pizzi’s preferred passing game except for a brief spell at the beginning of the match and a slightly longer one at the start of the second half. Pizzi also chose to leave Fahad Al Muwallad, who had started the last two games and looked effective as an attacker, on the bench. Russia initially employed a 4-2-3-1 with Alan Dzagoev pushing forward into almost a 4-4-2. But after his 21′ injury, a pulled hamstring that will keep him out of the remainder of the tournament, Aleksandr Golovin moved inside and took up a more traditional central 4-2-3-1 role, Denis Cheryshev coming in at left wing. This enforced change proved very effective for Russia, as it put their most influential player in the middle of the pitch. Russia had already scored off a lovely Golovin cross to the far post by this point, and Golovin would play a role in the build-up to Cheryshev’s goal near the end of the first half. Golovin was Russia’s best player, followed by Roman Zobnin; and it is probably not an accident that these were two of Russia’s three youngest players in the game. Russia had likely won the game in the first half, but it wasn’t a blow out until Pizzi took off his holding midfielder Abdullah Otayf to bring on Al-Muwallad. The shift to a 4-4-2, far from helping Saudi Arabia to chase the game, utterly destabalized a midfield that had been looking significantly better in the second half up to that point. It was this change, far more than Stanislav Cherchesov’s introduction of immediate goalscorer Artem Dzyuba, that changed the complexion of the game. Two utterly beautiful goals in stoppage time were icing on the cake, though they could prove critical in a group where second place might be determined by goal differential. Russia will now hope that this tournament does not repeat the Confederation Cup, where an opening 2-0 win was followed by two losses and a failure to advance from the group stage. Saudi Arabia will have to just hope. While Pizzi’s commitment to principle is impressive, it seems unlikely to earn points with the players currently at his disposal. The following is a slightly modified version of an article I was hoping to publish on why this was the worst opening game in World Cup history. Though it clearly wasn’t that, it remains a notable low point in the already unimpressive history of opening games. I hope that you enjoy these brief thoughts about what ELO ratings can tell us about this game and its relationship to other World Cup openers. Despite being fairly entertaining, there can be little doubt that this opener featured the worst combined quality level of any World Cup opener. That Cheryshev was able to dance about the box as if he were Lionel Messi is surely evidence enough of the low quality on display. Even the highly unreliable FIFA rankings suggested that this game would be a stinker. As the website Statista pointed out, Russia and Saudi Arabia have the lowest combined ranking of any World Cup opener since at least 1994. But the questionable nature of FIFA rankings (looking at you, No. 8 Poland) has led serious fans to turn to the alternative system of ELO ratings and rankings. Originally designed by physicist Arpad Elo to rank chess masters, ELO employs a system where each team has a rating based on an accumulated point total. After every game, the winner takes a number of points from the loser based on an algorithm that factors in the difference in team ratings, the margin of victory, and the significance of the contest (from the World Cup down to international friendlies), resulting in new ratings for each team. And because chess matches can end in stalemates, the algorithm is set up to deal with ties. ELO ratings produce results that pass statistical muster once a team has competed in about 30 games, and they just look a lot more convincing to the eye than FIFA’s rankings. Moreover, they have been retrospectively applied to all known international games back to the first England – Scotland matches in the early 1870s. This allows us to compare Russia – Saudi Arabia with every previous World Cup opener. H/C=Opener awarded to host nation or reigning Champion, Rk=ELO Ranking at start of Cup, Rate=ELO Rating at start of Cup, PtEx=ELO ratings points exchanged to/from the home team, C Rk=Teams’ combined ELO rankings, C Rate=Teams’ combined ELO ratings, CR V=Variation from the average combined ELO ratings in openers of 3730. Note that prior to widespread television broadcasting, the majority of early World Cups (1930-62) played opening round games simultaneously. The results aren’t pretty, even given the relatively low bar of other World Cup openers. As the table above demonstrates, Russia and Saudi Arabia are by far the worst teams to compete against one another in a single opener. Despite actually having to qualify, Saudi Arabia has the same ELO ranking—and a marginally worse rating—than the previous worst contestant, 2010 hosts (and automatic qualifiers) South Africa. 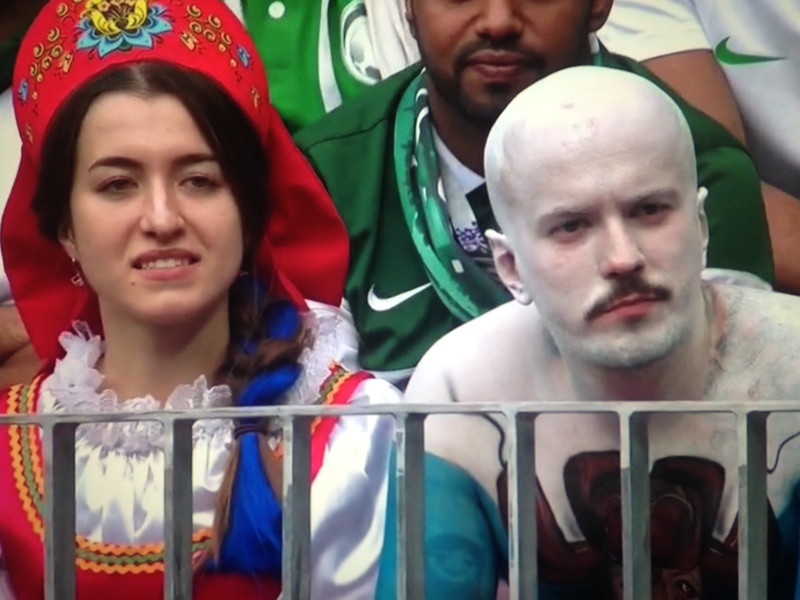 Not to be outdone, Russia is ranked two spots below previous second-worst, 1990 Cameroon, though they did enter the tournament 43 rating points higher than the Indomitable Lions. Of course, that Cameroon side pulled off one of the greatest upsets in the history of World Cup openers, beating Diego Maradonna’s World Champions, Argentina, and taking exactly 43 points from the win to eliminate that difference. Only Senegal’s 2002 upset of then-Champions France—in ELO terms, the 8thmost impressive upset in international football history—was more stunning. Both of those Cameroon and Senegal sides made it to the quarterfinals, each raising their ELO ratings by 81 points over the course of their respective tournaments. While the magnitude of Russia’s victory by five goals gives them an impressive ratings gain for this game, I think few viewers would consider placing this match alongside Senegal’s upset or Argentina’s losses to Cameroon, or even to Belgium in 1982. Even before this new low, the generally poor quality of World Cup openers has been fairly easy to discern. Leaving aside the troika of remarkable upsets against Argentina and France, and the expected but high-scoring feats of favored Brazilian or German sides, most World Cup openers have been nil-nil draws or something fairly close to it. As early as 1980, Brian Glanville lamented, “It had surely become plain enough that such preludes, pulling two teams from the pack and placing such pressure on them, were self-defeating.” But Glanville was mostly criticizing cagey opening affairs between teams who would both end up escaping the group. Because the openers from 1974 to 2002 highlighted the reigning World Champion rather than the host nation, at least one side in those openers was likely to have at least some idea of what they were doing. Of course, a game of football is more than just the sum of the quality—or lack thereof—of its teams. High-quality opponents do not necessarily make for a better game, as José Mourinho has frequently demonstrated; and Spain’s Barcelona-led tiki-taka revolution has even shown that what constitutes a boring game can change over time. If nothing else, today’s game demonstrates that you can have a fairly entertaining game despite two low-quality competitors (good news, MLS). Yet the trend of poorly-ranked hosts since 2010 has all but ensured an alarming level of soccer mediocrity. With Qatar, currently ranked 85thwith an ELO rating of 1486, looming on the horizon as 2022 hosts, things are likely to get worse before they get better. I don’t know…this was one of the worst kicks I have every seen…and utterly mediocre team struggling against a terrible one. I don’t know what was worse, the corner kick which didn’t even came close to the goal, the yellow card Russia picked up totally unnecessary while already in the 3:0 lead, frankly, we were sitting there shuddering about the fact that soon there will be even worse teams participating in the WC. NOT looking forward to it. Damn you Fifa. Most entertaining part was the ref…not that he did anything wrong per se, but I keep wondering if he is working as air traffic controller in real life. LOL. It was a low quality game for sure. MLS has probably numbed me to mediocre teams playing terrible ones. I think Egypt-Russia will be telling, and I think Russia will probably still struggle to get out of the group. Let’s hope today’s games are better.